Over at Double O Section he says he got a look at the upcoming James Bond Encyclopedia by John Cork and Collin Stutz at Comic-Con. The book will be organized firstly by topics such as Bond girls, villains, gadgets, vehicles, etc and then within the sections it will be alphabetized. The in-depth book appears to focus on all things in front of the camera rather than behind it and it should be noted that because the book is officially sanctioned by EON Productions that there is no coverage of either 1953’s or 1967’s Casino Royale adaptations or McClory’s Never Say Never Again. 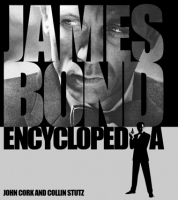 The James Bond Encyclopedia is due out on October 15th in the United States. You can already pre-order a copy on Amazon .